Hollywood celebrities have this image of being a bunch of effete, Prius-loving eco-weenies, but some of them are okay. Count Anchorman 2's Steve Carell in the Jalop crowd; he just went on TV saying how much he wants to be on Top Gear. Sweet! 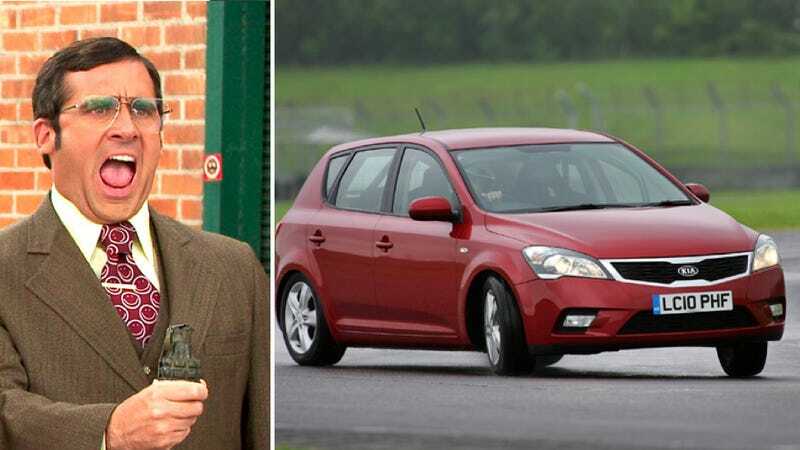 In an interview with Top Gear, Carrell expressed how much he loves the show and how badly he wants to be the Star in a Reasonably Priced Car, which is a Vauxhall Astra these days. Can he handle himself, the interviewer asks? Carell says sure — he has a Porsche 911 997 Turbo and can drive stick. "Although, I'm fearful that it I will come in — it will be badly accepted," he says, possibly still in character as Brick Tamland. "That didn't make sense." And when asked if he wants a hybrid Porsche 918 so he can be accepted in Hollywood, Carell says "I don't care about saving the environment." Well, neither does Chris Harris, but he had plenty of fun when he had seat time in a 918. As for Will Ferrell, well, not so much. He says he drives a Nissan Leaf and a Toyota RAV4 EV. Can't win 'em all, I guess. I'm surprised he's not daily-driving a Dodge Durango at this point.